Happy New Year!! I'm happily ensconced in front of my TV, watching the Rose Parade and generally feeling great about the year just past and the year yet to unfold. Following in knitlit's lead, here are the highlights of 2007 for me. This is a hard one! Each project has so much of me in it that they are all my favorites. I have different favs for different reasons- Tangled Yoke for it's classic and classy look, the Baby Surprise for the fascinating construction, the Herringbone Tank for my shot at design, U-Neck Vest for amazing fit and comfort. But the best of '07 goes to Ene's Scarf! 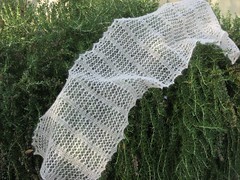 In a year of never ending firsts, this is my first lace, my first handpainted yarn and my first shawl. 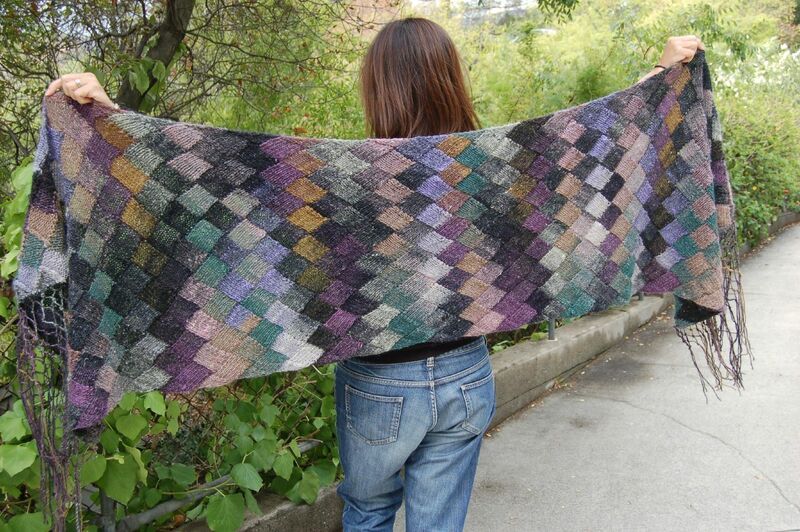 It never fails to impress the pants off of knitters and non-knitters alike. Oh, Malabrigo. Yum. so soft, so beautiful, so decadent! 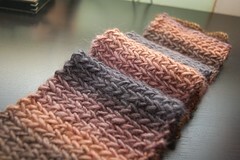 Fitted Knits by Stephanie Japel! I knit 5 projects from that book already. Cabling without a cable needle is revolutionary. I felt like I was pulling a magic trick every time I did it. 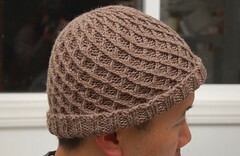 Knitting backward (useful for entrelac) was a close second, though. brooklyntweed - Jared inspires me with his knitting, design, handspun and photography. I "get" that we are involved in a pursuit of art and craft when I see his creations. 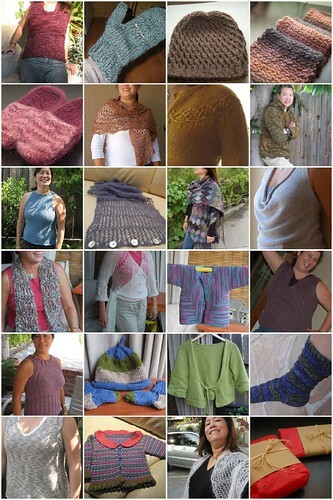 The Knitting BlogosphereWOW. You bloggers out there are an amazing group of people. You write so eloquently, you photograph so inspirationally, you create, you design, you teach but most of all you share. You share yourselves and you share your love of the craft. You are all my inspiration. New techniques. Since I am a relatively new knitter, everything is new to me. Each project inspires me with a new method of construction (BSJ?! Yoke sweater construction?!) a new cable or stitch, a new object (mittens). Every new experience makes me believe that someday I will designs items of my own! My blog. It is a way to hold myself accountable to finishing projects, a reason to raise my photography skills and a validation from people who know (other knitters) that my obsession is normal. At least to them. And, because I want to contribute to this community, I have aspirations of adding designs, tutorials and great links. This means I have to constantly improve my skill set to get there! That would also have to be brooklyntweed. 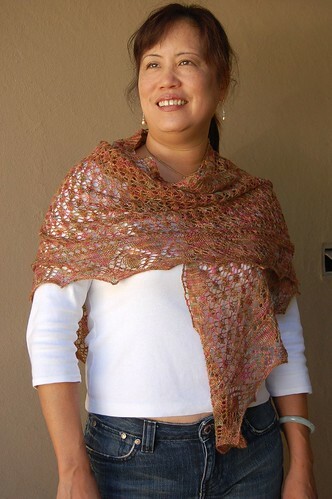 8. knitting resolutions for 2008--what's next for you and your blog? I want to design a top for myself from scratch. 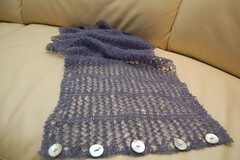 I want to knit a bag and another lace scarf. Maybe I might like to experiment with yarn dying. I really want to do a fair isle project with steeking, but I don't now if I am committed to that this year. We'll see. As for my blog - I keep threatening to move it to wordpress and create it's own domain. This would mean that I am committed to blogging - and making something of it. Am I that committed? There you go. 2007 in a nutshell. For those who surf on by once in a while or more, thank you. The validation that I get from your comments means the world to me. Non-knitters can say lovely things about my work, but you guys truly appreciate what I am doing. Thank you for your comments and compliments and I look forward to much more of the same in 2008!